Geert (Gent) shaking hands with Odette (Leuven 1). 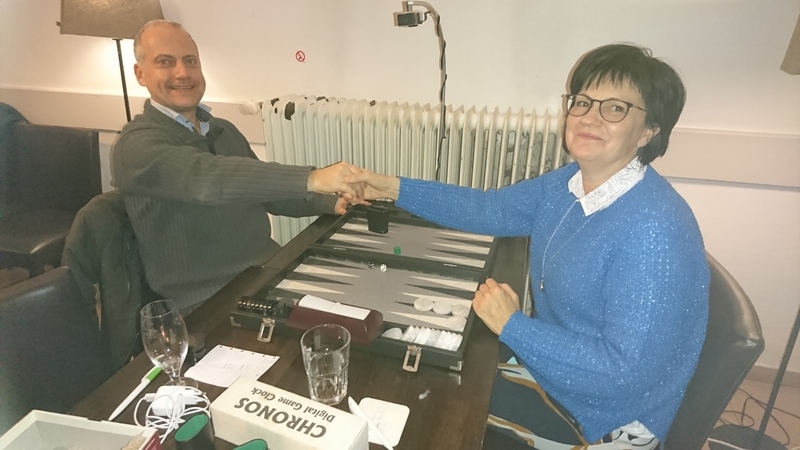 Their match was one of the nine matches between their two teams in the final round of the 4 Cubes 2018, the Belgian backgammon team competition. All six teams came together to play the last of five rounds of the 4 Cubes 2018, the team competition organized by BGFed.be. In the tennis club Longchamp in Uccle, Brussels 2 met Leuven 2, Leuven 1 met Gent, and Brugge met Brussels 1. The main area and the room upstairs were packed with backgammon sets, some cheap and some luxury, clocks, and recording equipment. Players from all over the country (and even from across the border) enjoyed an evening of playing and camaraderie, until the late hours. The encounter between Brussels 2 and Leuven 2 was the de facto final of the competition: the winner of the encounter would be first in the final ranking and earn the right to hold and display the precious 4 Cubes trophy throughout 2019. Around midnight, it was Leuven 2 that came out on top. Congratulations for the team, who already won the 2016 and 2017 editions. Full results can be found in the Tournament Book. We would like to thank all players and team captains for their participation, sportsmanship, and fair play. Fixing dates and motivating players was not always an easy task, but some team captains showed remarkable patience and gentlemanship. The organizing committee has listened carefully to the feedback and suggestions formulated by the captains and will soon come up with a proposal for the 2019 edition. This entry was posted in The 4 Cubes. Bookmark the permalink.